We’ve told you before our people are crazy. And strange… And now I believe even stronger in this statement because lately the human female is very attentive to our poop. Mine and Data’s, not Spock’s and Kirk’s which seem to satisfy her curiosity. For few weeks now she believes my poop is lose. But not lose enough to get us to the vet. This I don’t get: if we don’t need to go to the vet, then why worrying? 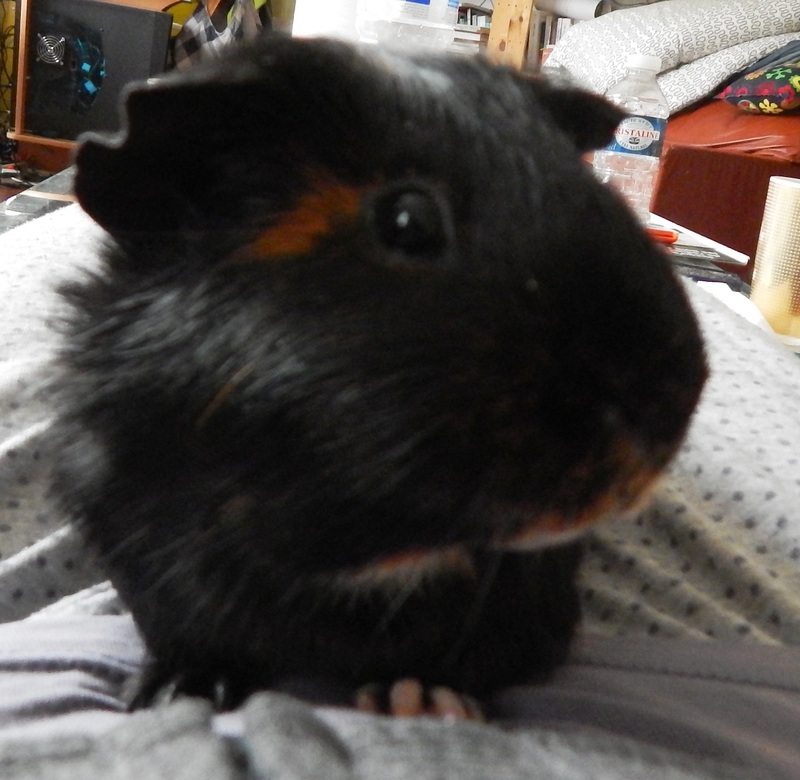 Anyway, she decided to help my digestion and gave me Actimel. And I became addicted… But, after stopping the treatment, my poop was once again a little bit lose, enough to make her go crazy again. Me being happy, active and normal was of no importance to her and her mined kept turning and analysing why my poop is not as she wanted it. Finally, she decided that I don’t eat enough hay. This was true. I am not very passionate about it. Or at least not about the one she used to give me. Something triggered a brilliant idea in her brain and made her understand I did not like that kind of hay, but I liked another one. 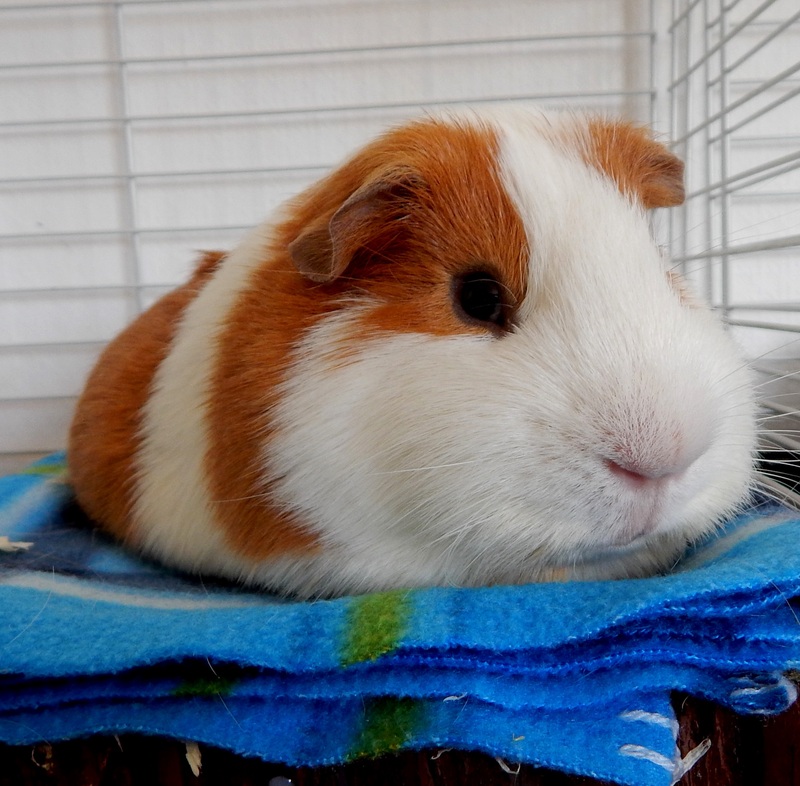 So, on Monday the human male was rushed to the supermarket to buy another brand of hay for me and only for me. 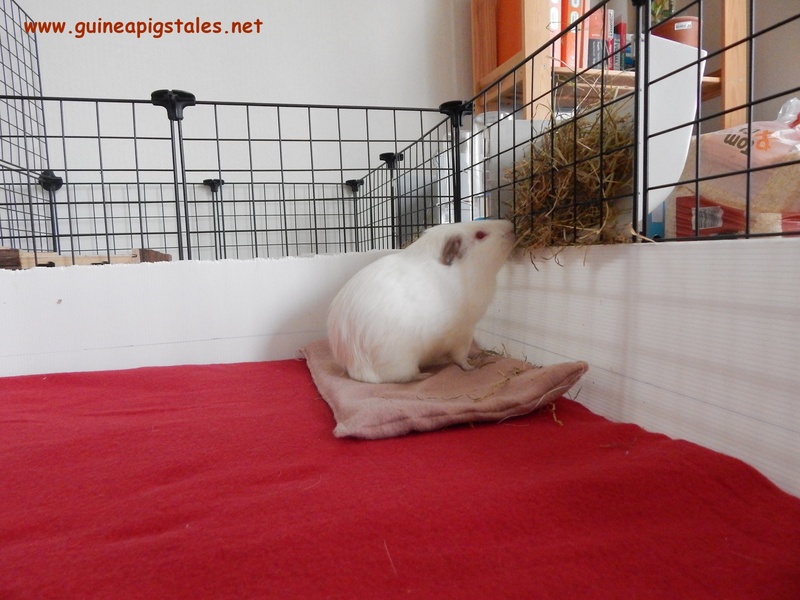 Now I consume a little bit more hay and my poop is satisfying for her. Still not perfect, but she seems less stressed. First of all, we are sorry for our absence. 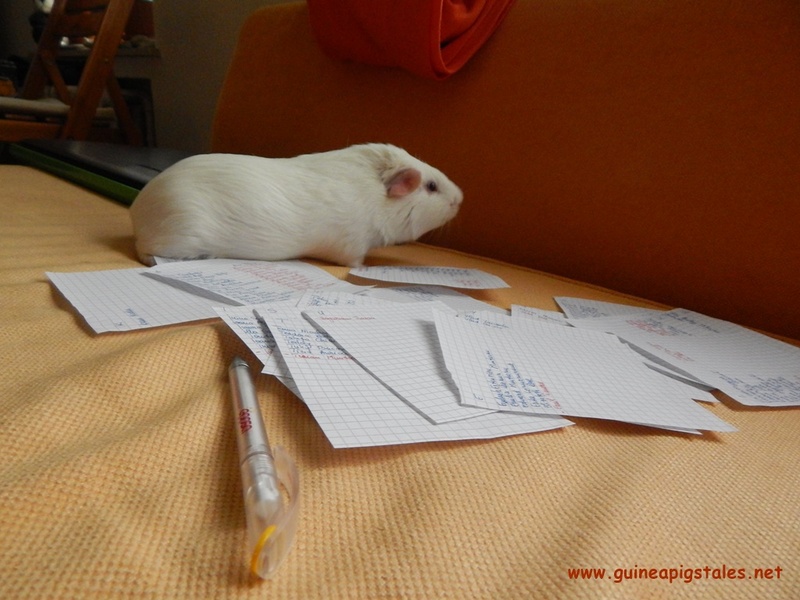 But… We were very busy campaigning, planning and executing in order to help Kirk winning the contest launched by Kevin the Cavy. 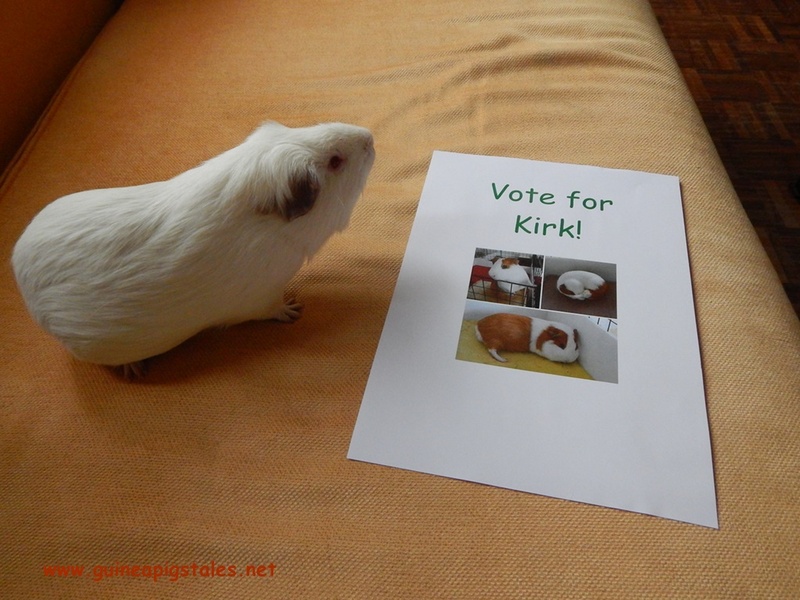 Unfortunately, despite our best efforts, Kirk is some 120 votes behind the Guinea Pig on the first place. 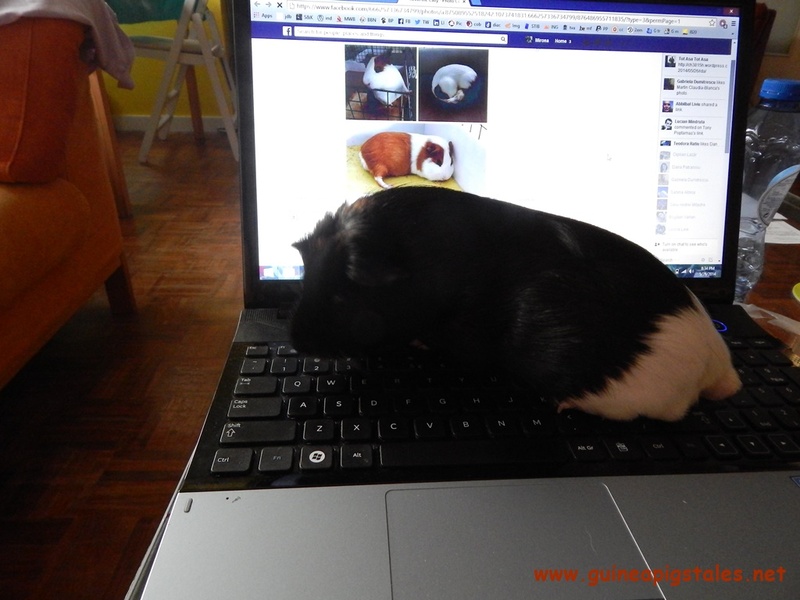 We suspect that piggy taking over his human Facebook account and hacking all the friends’ accounts to get votes. Of course, maybe he is more fortunate and his human has a lot of Facebook friends, not like ours that have only four hundred something (the female) and one hundred (the male). Anyway, we were really creative and all working for the same purpose, including the human female. She gave us access to her Facebook account and her own blog and we could spam all her “friends” with requests for votes. Some of other Romanian bloggers and friends even helped us and shared our message. Spock was in charge of the campaign flyers and he managed to do a good job. He even abstained himself from chewing the posters. Of course I was in charge of planning and organizing everything, so I’ve spent several days buried in papers and analyzing names, sending messages and fighting for our cause. Kirk had only one thing to do: stay in shape. And he seems to be very good at it. So, we admit we have no means to overlap the difference of votes. But we are very thankful for the almost 300 votes we already got. Our Facebook page has only 83 followers, so we never expected so many votes. Anyway, if you still want to help and vote, you can do it following this link. Europe is in the middle of some elections for the European Parliament. Also some countries are electing their own parliaments… USA had some elections also. So, we thought, why not campaigning for something?! All these frenzy got us and we don’t want to stay aside. As we do not like politics, it was a tough decision to pick the subject of our campaign. Fresh vegies and the right to poop and pee whenever and wherever were already gained by our ancestors. The right of having a human servant is also implicit, so what should we fight for?! But thanks to Kevin the Cavy we found a purpose in life! At least for short term… So, I was asked by the Gang to participate in the contest and run for the possibility to have an appearance in a sketch. It was hard to accept this challenge, but I had to admit my pictures were the cutest. The goal had been settled, how about the champagne?! Data underlined very well that we should focus on Facebook given the fact that I need some likes. Everyone participated in the making off of this champagne! Being focused on Facebook, an investment in banners and flyers is almost useless and we decided to save the money for diapers and fresh vegies. In case you want to hack into your biped’s Facebook account and vote for me, you can give a like here. And if you are not yet convinced I’m cute enough to win, just take a look of this picture. This Data! He is such a friend! I’ll eat his ears next time he slips them between the bars of the fence… Why?! Because yesterday he made public my addiction to Actimel! It wasn’t enough the humans recorded me and posted the video on the Internet, he to tell to our readers also. And now I feel obliged to explain myself. Remember when I said the human female freaked out I lost some weight? 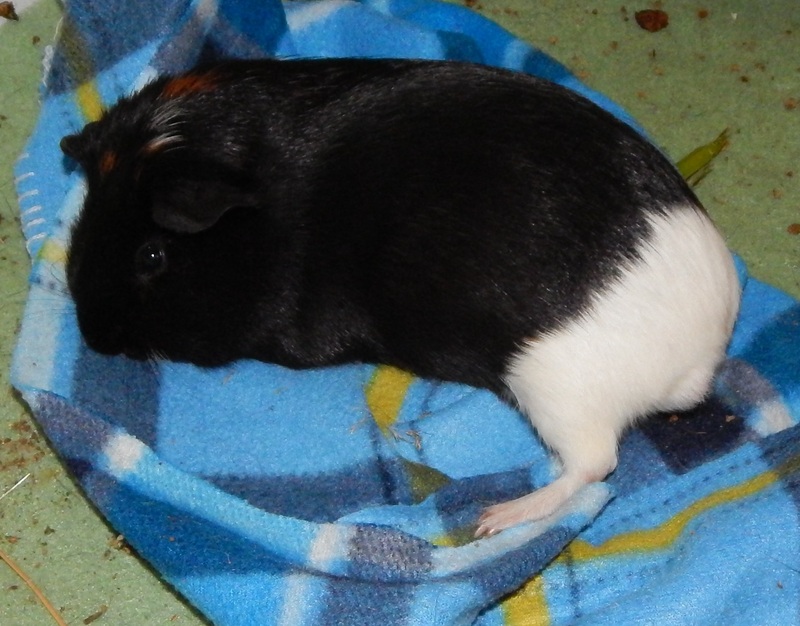 Well, apparently, my poop is also a little bit loose, so she assessed the situation and considered is not that bad to go to a vet, but an immediate action was required. And some probiotics seemed to be the best solution at the first glance. As Spock got fine with Actimel, she decided to try it on me also. First time she approached me with a 1 ml syringe filled with some whitish liquid I refused to obey and to consume it. She kind of had to force me… Second time I remembered what was all about and decided to cooperate. Starting the third time it became addiction! Honestly, when I see the syringe in her hand I forget I’m the most scared piggy in the world and just come out from where I’m hiding and eat it all. I always ask for more, but never get… Tugging the syringe doesn’t help! So, I am addicted and have no idea what I’ll do if I won’t be given Actimel anymore. I think I need therapy… I’m going to wake Kirk and talk about it. 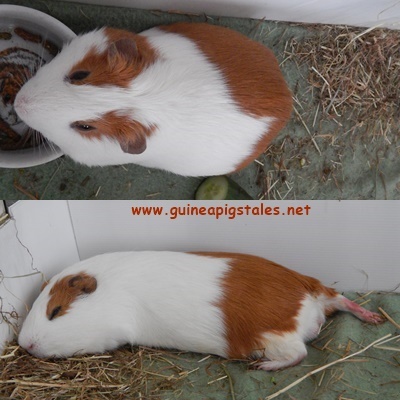 Actimel is a probiotic but also a yogurt and Guinea Pigs shouldn’t be fed yogurt. That’s why “the treatment” is limited to 1ml of Actimel twice per day. And this should not last longer than few days. If the digestive problems are serious (e.g. diarrhoea) or persist, check with your vet asap! In the morning she sew, so she made quite a noise making almost impossible any deep relaxation and sleep. I was forced to spend two hours watching her preparing some fleece pads for our cages and to find myself something else to do, like munching on hay, pooping, getting in to small conflicts with Data etc. 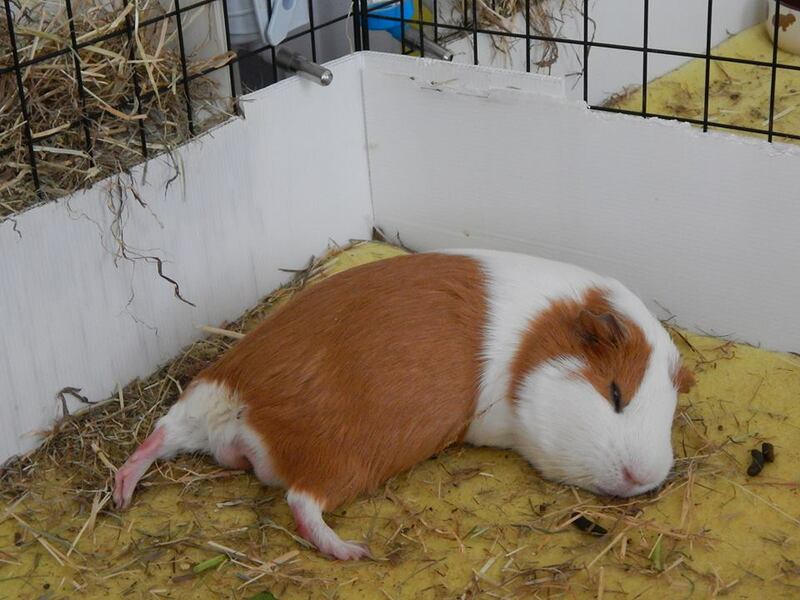 When she stopped and left home to do the groceries (mainly vegies for us), I hopped that was all and went to sleep. I was so tired! But she came back from the supermarket and decided it’s time to clip our nails. True, it has not been done in weeks, but I still hate this and refuse to cooperate. When I saw Kirk getting through it, I was already decided I would give them a harsh time. I was so stubborn that it took her 10 minutes and a lot of zen attitude to clip the 6 nails from my hind paws. She asked for help from the human male and I was even more infuriated. So, I took advantage of the position and bit his ear. He was so shocked that forget to put me down on his way to the mirror. No worries, I’ve just made a very small hole through his ear, but the ear in itself is still attached to his head and in one piece. 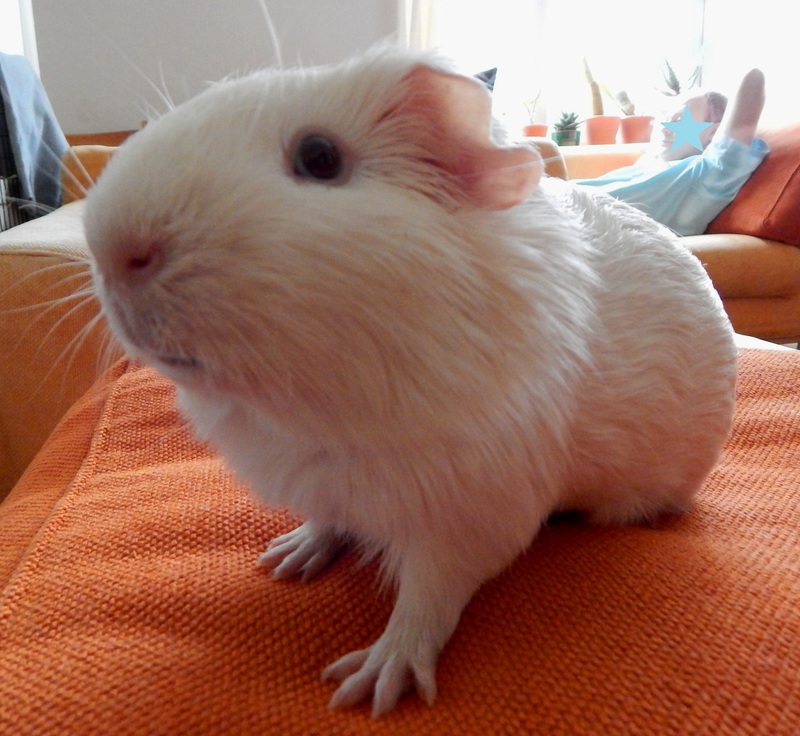 Finally, the human female managed somehow to convince me to stay still for another 8 nails and, as a reward, I got some parsley and the opportunity to take a walk in the living room. This was very nice given the fact that we had guests and I’ve got the chance to interact with them. But not too much because I’ve discovered the camera’s tripod and realized it was not yet marked by my teeth. 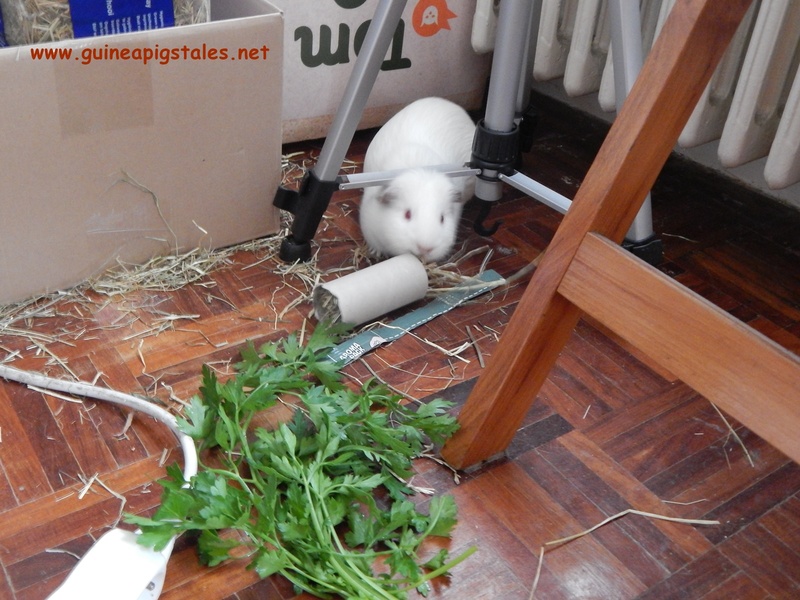 Also some hay was dumped on the floor and I had to interfere and clean it out. 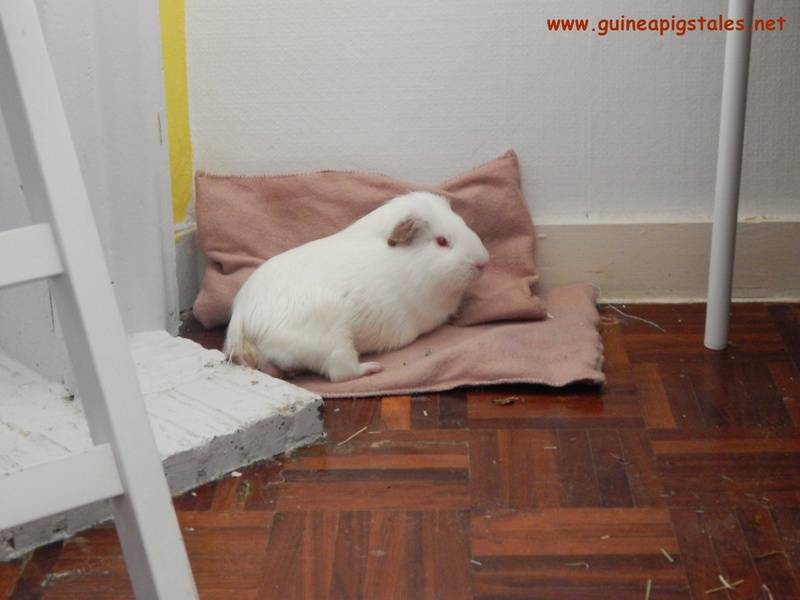 After one hour of playing the nice host, cleaning and inventorying the house, I felt asleep on a small piece of fleece that I found on a corner. Taking advantage of my sleepiness, she grabbed me and put me back in my room. But, to my huge surprise, there I found a brand new red fleece! The perfect colour matching my eyes! It was bought by the human male and now I’m pretty sorry I have bitten his ear. Finally, I got the chance to use the laptop and I wrote this. So I am very very tired. And I am also very impatient to sleep on the red fleece because I think it must be different from sleeping on the green one. Yeah, now I’ll go back to my regular Saturday evening. Have a nice week-end! Now, don’t you worry, we are all just fine. Maybe the humans’ hearts are a little bit weaker, but we are fine. But let me tell you what happened! Sunday morning we had the usual session of weighting. Kirk had his normal almost 1.400 kilos; Spock a little bit less than 1.200 kilos, so nothing unusual. When she got to Data, the scale insisted on showing the same number as last week. The human female tapped it several times but no change. Then it came my turn. And then she really turned white. 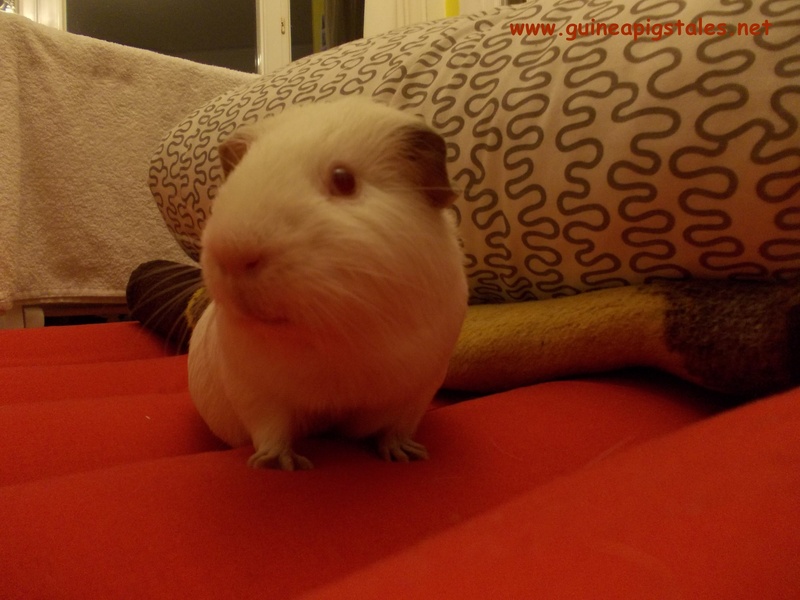 So white that Data looks dirty compared to her face… I lost 13 grams from my beautiful weight of 900 grams. With her trembling hands, she put me back in my room, took the notebook and noted down our weights. She fed us and then she tried to compare what just happened with her previous experience with Kirk and Spock. After realizing that this occurred at least once with the two big boys, she was back to an almost normal breath. Honestly, I don’t understand her. I mean we look healthy. 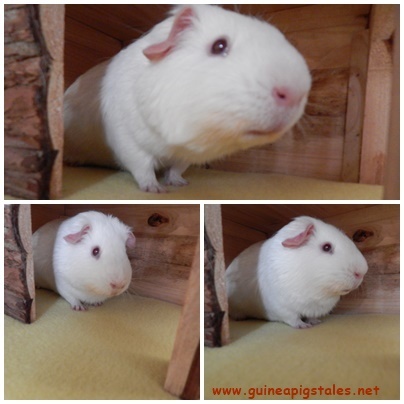 I popcorn all the time and Data has his scurry outbursts very often. We eat normally and poop as we should. Why worrying that much? Anyhow, good that she got scared because now we’ve got the right to eat cereals. No sugar though, but still… And cereals are good! So, now I’m also panicking: I need to gain weight or the crazy female will cram me with all the vegies you could imagine! By the way, do I look underfed?